My town has several boat launches, but Simpsons Point is the only public access to ocean swimming. On hot summer days at high tide, a friendly mix of locals and summer visitors gather. Real Mainers don't seem to mind hypothermia, but I grew up in New York City. My idea of a two-piece bathing suit is this wet suit. Laugh at me through your blue lips. My favorite time to swim is early morning, when the tide cooperates. Peeking through the mist, islands hide from the rising sun. Every stroke is a brush on canvas, rippling the placid blue. Sometimes my husband and I spot a kayaker or a harbor seal, but mostly we're alone with the shorebirds. To warm up, we bike 4 miles back to our house in town. There is no better way to start a day. When in Maine, check a tide chart before swimming or boating. At low tide estuaries become mudflats. Simpsons Point is best within 2 hours of high tide. Brunswick Residents: tonight the Marine Resource Committee is considering a proposal to re-open Simpsons Point to power boats. If you're a swimmer or a paddler, please come in support of Brunswick's only public swimming access to the sea. Tonight's meeting will be at Brunswick Station at 7PM on Wednesday August 5th (wrong date printed in the Times Record yesterday). A second meeting will be on Monday August 12th at 5PM. More info in The Times Record. Damn, that water looks cool (in both senses, cold and fashionable)! I've no idea but the combination of your photos and Van Morrison's Moondance blasting out of my speakers has made me smile. The sun's out here and the temperature is warm and inviting enough to go out for a run later on. So, maybe no swim for me but you have inspired me today. David, and bloggers? You are due for a visit. ACIL, my son sometimes runs to Simpsons Point through the woods trail - that's 10 miles round trip. Enjoy your run! Never thought I'd be paired with Van - ha! You make me wish I'd learned to swim! Simpsons Point looks so idyllic Sarah. Best of luck with a good turn out of citizens to keep it that way. I need to get a suit like yours with the shoes too. Beautiful writing! As a Minnesota raised girl, I'm not laughing at your wet suit (you look great in it!) I once developed hypothermia while swimming in Greece of all places (it was June and very cold water) so I prefer to avoid blue lips, too. Simpsons Point is downright painterly. Pamela, it's not too late to learn. I was a reluctant swimmer as a child, but now I love it. 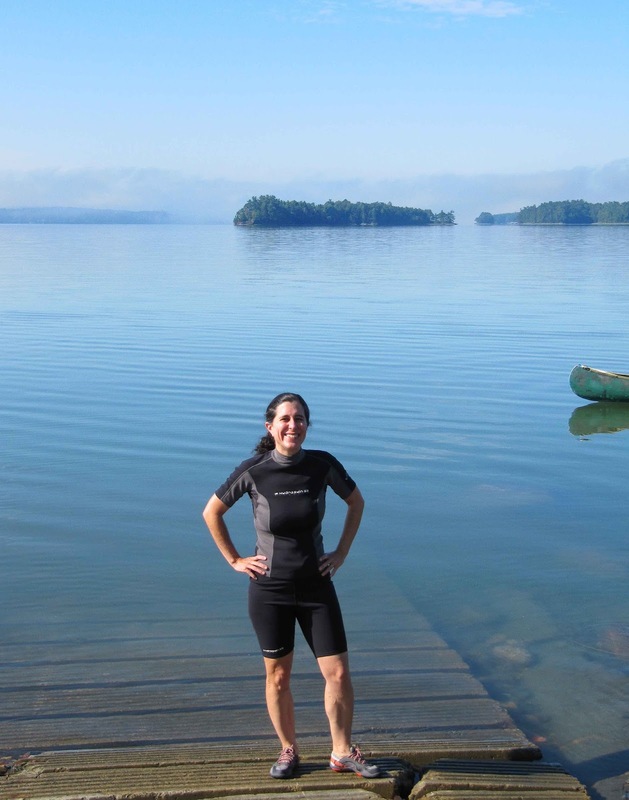 Carol, the wetsuit was actually designed for kayaking, and it's perfect for cold but not frigid water. I got it and the lace up water shoes at the LL Bean store in Freeport. Amanda, most people manage without a wetsuit in summer. I'm a wimp but a warm one. All, the meeting was very informative. It looks like there will be a compromise to allow the clammers and duck hunters power boat access during the cold months but keeping the deep water access for swimmers in summer for now. Power boats and swimmers don't mix, especially with all the kids learning to swim. There was also talk of a dedicated public swimming park at another location in Brunswick. Fingers crossed! Swimming and biking, great way to start your day. Sounds like an amazing way to start the day--all you needed to add was a quick run for a triathlon. Love your painting of Sagahadoc Bay below and so cool it's headed to London to the home of a reader. Nice to know your meal at Spinney's included onion rings made from Georgia onions! Laughing- laugh at me through your blue lips. haha. So how did it go? (results of the meeting). And the other is tomorrow night- good luck. Beautiful spot. Looks peaceful. I would love to see the harbor seal!! My husband and used to go kayak in Town Lake here but it is packed with people so we'd try to go early or late and in the week. Looking forward to going again. Cynthia, unfortunately my knees won’t run. I hadn’t realized that Videlas come from Georgia – lucky you. Nice to catch up! Kacky, the meeting was very informative. The most likely and fair outcome would be a compromise to allow the clammers and duck hunters power boat access during the cold months but keeping the deep water access for swimmers in summer for now. Powerboats and swimmers don't mix, especially with all the kids learning to swim. There was also talk of a dedicated public swimming park at another location in Brunswick. I can’t make tomorrow’s meeting since I have to ride with my daughter on her last driving lesson before she gets her permit. Fingers crossed! Margie, sorry didn't mean to miss you. Nice to hear that we have swimming and biking in common. While I wouldn't think twice about grabbing a paddle to explore those beautiful waters, you could not pay me to swim there. I usually complain here until August when the water finally turns warm enough to suit me. I hope your swimming spot will remain free of power boats. That is awesome! You are so blessed to have that in your town. What a beautiful place! 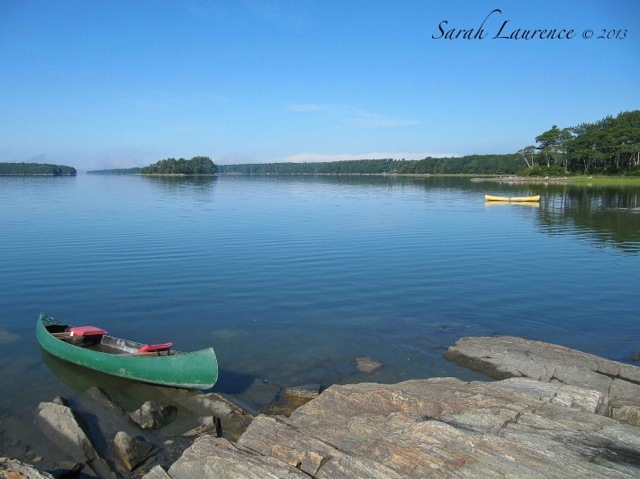 I am so enamored with Maine....and will be visiting it next month! CAnt wait to see this beautiful place for myself! troutbirder and Les, the water is actually warm enough to be wetsuit free in August. Alyson, yes but for a coastal town, water access is quite limited. The town is working to create more public parks. Heather, welcome to my blog and to Maine!